We can all agree that the world is a scary place. Often, the sheer range of the human experience is enough to drive anyone off the deep end, and there are times when the world feels big enough to simply swallow us whole. Somehow, despite their youth and relative inexperience, Happy Diving are confronting the world full-throttle, jumping in head-first. 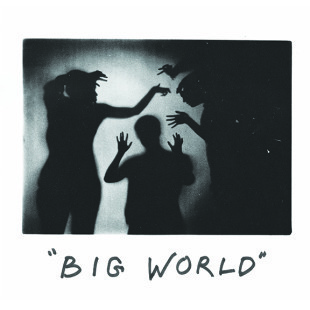 The band’s debut full-length for Father/Daughter Records, Big World, fearlessly takes the plunge, running the full gamut and back again; exploring the moments of feeling immeasurably small, the moments of empowerment, and every baffling moment in between. Big World narrates these times in full earnestness through raw, melodic power and a natural, rhythmic ease. Big World confronts life’s most maddening fears and disappointments: heartbreak, anxiety, boredom, frustration. Wielding the power of a thousand mega-hooks, these moments are broken down into bite-sized pieces, becoming easier to digest (and perhaps even comforting.) Twenty-year-old Happy Diving leader Matt Berry is a straightforward sort of lyricist, penning words that blow straight to the gut with hardly any effort at all. He’s skilled at digging into the complexities of emotions like insecurity and sheepish self-doubt (“When you saw me, did I look bad? Or did I look the same as I always had?” on “Space Ooze”). Later, he pummels them away via splashy guitar work and boundless intensity. These are giant undertakings, and the record tackles them with a shocking amount of grace. Still, Happy Diving haven’t completely abandoned some of the erratic methods employed on last year’s self-titled EP; screeching tune-ups permeate each track, and there’s an overall haphazard quality to the recordings. Comprised of Bay Area natives, the band expertly marries the East Coast crunch of contemporaries like Ovlov and Speedy Ortiz with the noble virtue of its influences (Weezer, Dinosaur Jr.) It’s a blend that makes for some awe-inspiring occasions—the raw, rib-sticking goodness of the riff on “Small World”, for example, or the wonderfully jerky stop/start rhythm of “Space Ooze”—but it’s difficult to pinpoint which path these rookies might follow. Big World is a short record—just 10 tracks—and it’s clear that Berry and Co. haven’t said all there is to say. That’s cool. Happy Diving are just scratching the surface on some monster-sized topics, and although Big World is ambitious, it never falls flat. Loren DiBlasi is a staff writer at Impose and freelance music writer, covering sounds from Brooklyn and beyond.